← Library Instruction and Information Literacy…There’s an Organization (and Conference) for That! More and more Americans are buying smart phones. And librarians are taking steps to utilize these new technologies to deliver services. But I want to spend a minute contemplating the other side of smartphones – the phone. People still make phone calls. 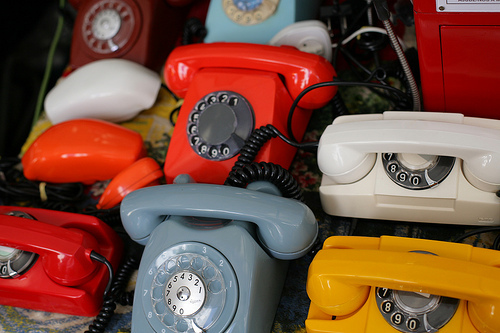 A survey from the Pew Internet and American Life Project shows that the average adult still makes/receives five calls each day. Millenials, our future library users, may text a lot, but they know where the call button is, too. The Rochester Studying Students library study also demonstrates that students still want the library’s number, going so far to ask for it on the library home page. So what does this mean for libraries? I think it means that telephone reference isn’t dead. Unfortunately, it can be harder to serve patrons over the phone as well as at the reference desk. There are none of the non-verbal cues of in-person reference to help with the reference interview, and no record to later analyze for improving service the way that there is with virtual reference. Some information is much easier to convey visually or in writing – giving a patron a web address over the phone, after being certain they have internet access, can be an adventure. (Question: how do you explain a URL with a tilde to someone who doesn’t know what tilde is? Answer: find a link shortener quickly.) Also, planning for telephone reference just isn’t exciting. Making a clear, navigable, informative phone tree seems less fun than making a clear, navigable, informative web page. Given the statistics on calls vs. web site visits, the emphasis should be on the latter. But we shouldn’t stop improving things for our callers either. And when was the last time you promoted your phone service? Maybe librarians have mastered telephone reference, so we don’t need to talk about it anymore. Even if that is the case, we should remember that it was the hot new technology for libraries to adopt at one point in time. As we implement new technologies, we can consider how our predecessors dealt with providing service in a new environment. Maybe it bodes well for text-a-librarian services that after so many years, phones are still here. For some interesting reading on how librarians were adapting to telephone reference when phones were just for making calls, check out Emily Garnett, Reference Service By Telephone, 61 Libr. J. 909 (1936). This entry was posted in Customer Service, Library Statistics, Reference Services and tagged new technology, old technology, pew, reference, telephones. Bookmark the permalink. Good reminder of the importance of phone requests (75 years of phone reference!). We don’t get a lot of calls at our academic library, but when alaw student calls and the communication reaches one of those barriers, I ask for the student’s email address and tell them I’m going to mail them some information. Technology can be isolating. The phone is overlooked by folks who weren’t around for “reach out and touch someone” ads. The best part about the phone is that it is just one of the many tools we have.